BEAR DOWN, CHICAGO BEARS, BEAR DOWN!!!! 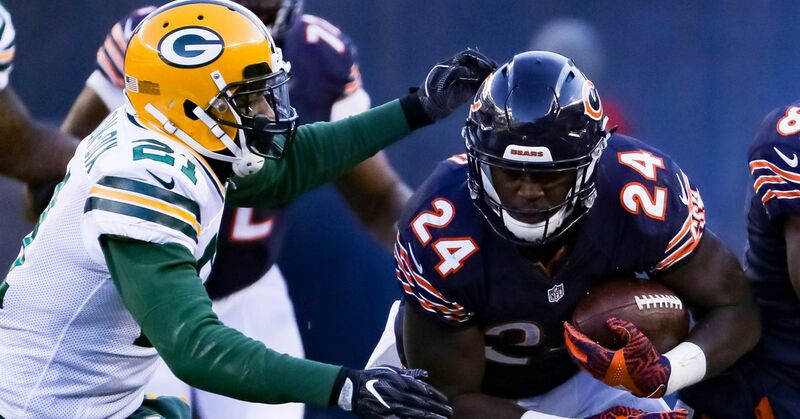 Wiedman: NFC North looking to fight for the top – Our Turf Football – Wanda Wiedman takes a look at the free agent signings in the NFC North, and how they could affect the race for first place. Pearson: Culture change a common theme for Bears free-agent signings – 247SportsThe – culture is changing at Halas Hall and free agents are starting to hear about it, which rings as good news for the Bears’ future. Emma: Bears’ Quiet Week Is A Winning Luxury – 670 The Score – For GM Ryan Pace, free agency means supporting what he has built. Emma: Cordarrelle Patterson Brings Bears Another Playmaker – 670 The Score – Patterson called it a ‘no-brainer’ to sign with the Bears. Emma: Bears Sign Ha Ha Clinton-Dix To 1-Year Deal – 670 The Score – The Bears will sign safety Ha Ha Clinton-Dix to a one-year deal. Hughes: A Few Quick Thoughts on the New Bears: Cordarrelle, Buster & Mike – Da Bears Blog – Cordarrelle Patterson, WR/RB/KR – The Bears needed someone to be their kick returner. Yes, the position has been devalued in recent years but no team was worse returning the kickoff in 2018 than the Bears. They were THIRTEEN yards worse than the league’s best kickoff return average. That’s astronomical. Cox: Ha Ha Clinton-Dix turned down more money to play for Bears – Bears Wire – The Chicago Bears signed former Green Bay Packers safety Ha Ha Clinton-Dix to a steal of a one-year, $3.5 million contract. Mayer: Free agents lured by culture, chance to win – ChicagoBears.com – The three players the Bears landed on the first day of free agency were all motivated to join the NFC North champions for the same reason. Mayer: Bears ink veteran safety Clinton-Dix – ChicagoBears.com – The Bears on Thursday bolstered their secondary by signing veteran safety Ha Ha Clinton-Dix to a one-year contract. Video: Patterson – You have to want it – ChicagoBears.com – New wide receiver Cordarrelle Patterson sits down with Lauren Screeden. Video Update: Bears free agents arrive at Halas Hall – ChicagoBears.com – Lauren Screeden has the latest from Halas Hall after the newest members of the Chicago Bears arrived on Thursday. Video on NFL Network: Clinton-Dix heading to Chicago – ChicagoBears.com – NFL Network’s Mike Garafolo discusses the Chicago Bears’ signing of safety Ha Ha Clinton-Dix. Video Highlights: Ha Ha Clinton-Dix – ChicagoBears.com – Check out highlights from new Bears defensive back Ha Ha Clinton-Dix. Medina: Goodbye Old Friend – Kevin White Signs With the Cardinals – Bleacher Nation – Kevin White’s time with the Bears is over. Medina; Bears Could Overhaul Special Teams Unit After Not Tendering Contracts to Scales and Houston-Carson – Bleacher Nation – RFAs Patrick Scales and DeAndre Houston-Carson weren’t tendered contracts, leaving the Bears special teams without some core members. Medina: Bears Sign Ex-Packers Safety Ha Ha Clinton-Dix to Replace Adrian Amos – Bleacher Nation – Ha Ha Clinton-Dix is back in the NFC North. This time, he’s on the Bears’ side of the NFL’s longest-running rivalry. In their own words: What will Bears’ free-agent signings provide on the field? – Sun Times – Three of the Bears’ free-agent signings — Cordarrelle Patterson, Mike Davis and Buster Skrine — talked to the media on Thursday. Finley: Culture club – What Bears’ free-agent signees said about winning atmosphere – Sun Times – The Bears’ signees reinforced general manager Ryan Pace’s belief that Chicago has become a free-agent destination. Chicago Bears Podcast: Hoge & Jahns on Bears’ signings in free agency – Sun Times – The Bears signed four new players after the NFL’s new year opened Wednesday. Finley: Bears safety Eddie Jackson makes big money in performance-based pay – Sun Times – Bears safety Eddie Jackson went to his first Pro Bowl and received his first All-Pro honor in 2018. Wiederer & Kane: 5 things we learned about 3 new Bears, including Buster Skrine’s versatility, Cordarrelle Patterson’s respect for Devin Hester and Mike Davis’ fit on offense – Chicago Tribune – After slot cornerback Buster Skrine, wide receiver/kick returner Cordarrelle Patterson and running back Mike Davis met with their new bosses in Lake Forest, they joined the Chicago media on a conference call to talk about why they decided to join the Bears. Ingalls: Ryan Pace has a quiet but productive start to free agency – Chicago Audible Podcast – So far, Ryan Pace hasn’t made the biggest free-agent signings, but he has been able to add solid talent for a good price. Stankevitz: In Ha-Ha Clinton-Dix, Bears add more than a friend of Eddie Jackson – NBC Sports Chicago – Signing Ha-Ha Clinton-Dix to a cheap one-year deal looks like a steal for the Bears’ defense. Stankeviz: The Bears’ culture created by Matt Nagy is resonating across the NFL – NBC Sports Chicago – Players around the NFL are taking notice of the culture established by Matt Nagy at Halas Hall. Andraki: Bears fill need in secondary by signing Ha Ha Clinton-Dix – NBC Sports Chicago – The Bears have apparently filled a hole in their secondary by adding safety Ha Ha Clinton-Dix on a 1-year deal. Neveau: Bears WR Kevin White Expected to Sign With Cardinals: Report – NBC Chicago – Kevin White was the Chicago Bears’ first round draft pick in G.M. Ryan Pace’s first year with the team, but things never worked out, and it appears the wide receiver is moving on. Williams: Kevin White joining the Cardinals – ProFootballTalk – The Cardinals are signing receiver Kevin White, Ian Rapoport of NFL Media reports. White, 26, visited Arizona today. The Bears made White the seventh overall pick in 2015, but injuries derailed his career in Chicago. He appeared in only 14 games and made only five starts in his time there. Finley: Bears to sign safety Ha Ha Clinton-Dix – Sun Times – He spent his first 3½ seasons with the Packers, earning one Pro Bowl berth, before being traded to the Redskins at last year’s deadline. Bills GM rips notion FAs don’t want to go to Buffalo – NFL.com – Bills general manager Brandon Beane is pissed off over the outside perception of Buffalo after a potential trade for wideout Antonio Brown fell through. Panthers release left tackle Matt Kalil after two years – NFL.com – The Panthers announced they have released left tackle Matt Kalil, just two years after signing him to a five-year, $55 million deal. Kalil missed all of 2018 with a knee injury. Teope: Bears signing Ha Ha Clinton-Dix to one-year deal – NFL.com – The Chicago Bears are signing safety Ha Ha Clinton-Dix to a one-year-deal worth $3.6 million, Ian Rapoport and Mike Garafolo reported. Will the Packers’ free agent prizes alter how they approach the 2019 NFL Draft? – Acme Packing Company – Green Bay signed a player at each of their key weaknesses in free agency. The prices may have been high, but they offer the team flexibility in the draft. Packers make free agent signings of Smith, Smith, Amos, & Turner official – Acme Packing Company – The Packers’ GM will meet with the media on Thursday afternoon to discuss the big moves. What should the Packers do in the next wave of free agency? – Acme Packing Company – APC looks at several players still on the market who could fit in Green Bay. Raiders release Jordy Nelson – ProFootballTalk – The Raiders released veteran receiver Jordy Nelson, Marcus Thompson of TheAthletic.com reports. Nelson was due a $3 million salary, up to $500,000 in a roster bonus and a $100,000 workout bonus this year. After the Raiders gave Nelson a $3. Lions free agency: Detroit signing safety Andrew Adams – Pride Of Detroit – The Lions are adding some safety depth. It turns out some players DO want to play for Matt Patricia – Pride Of Detroit – All 3 of the Lions’ newest signings mentioned Matt Patricia as a draw to Detroit. NFL free agency: Golden Tate signing 4-year deal with the New York Giants – Pride Of Detroit – The former Lions receiving is heading to the Big Apple. Reports: Vikings DE Everson Griffen Restructuring Contract – Daily Norseman – The move will keep the Vikings defensive end around and likely free up cap space. Wiltfong’s Bears 2019 free agency tracker (3/14): News, signings, cuts, and more – Windy City Gridiron – Former first round draft pick, Kevin White, is heading to the Arizona Cardinals. Duerrwaechter: Chicago Bears sign Ha Ha Clinton-Dix Free Agency 2019 – Windy City Gridiron – The former Packer and Redskin safety is the latest addition to a ferocious Bears defense. Windy City Gridiron Community Guidelines – SBNation.com – We strive to make our communities open and inclusive to sports fans of all backgrounds. The following is not permitted in comments. No personal attacks, politics, gender based insults of any kind, racial insults, etc. The Bear’s Den Specific Guidelines – The Bear’s Den is a place for Chicago Bears fans to discuss Chicago Bears football, related NFL stories, and general football talk. It is NOT a place to discuss religion or politics or post political pictures or memes. Unless otherwise stated, the Den is not an open thread, and profanity (including profanity only stated in pictures) is prohibited. WCG Contributors: Jeff Berckes; Patti Curl; Eric Christopher Duerrwaechter; Kev H; Sam Householder; Jacob Infante; Aaron Lemming; Ken Mitchell; Steven Schweickert; Jack Silverstein; EJ Snyder; Lester Wiltfong, Jr.; Whiskey Ranger; Robert Schmitz; Robert Zeglinski; Like us on Facebook.